In the bowl of a food processor or blender add the oil, vinegar, parsley, salt, and pepper. Pulse to finely chop the parsley. Pour into a bowl and reserve. Preheat an outdoor charcoal or gas grill or a grill pan until smoking hot. 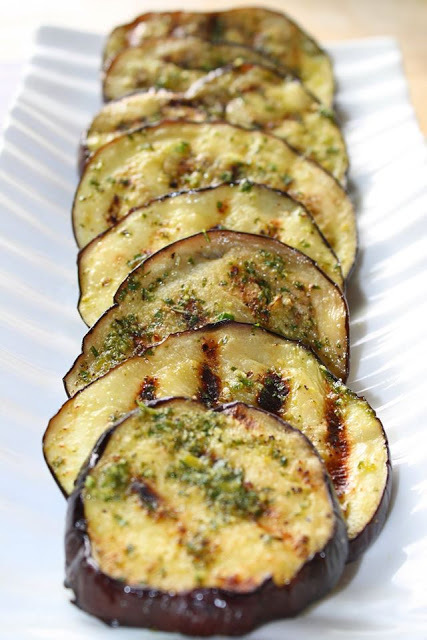 Brush the eggplant slices on each side with olive oil and then arrange the slices on the grill to cover it without crowding. Cook the eggplant until well marked, 3 to 6 minutes, then turn the slices over. Cook until tender, about 3 minutes more. Pour the marinade into a shallow dish and dip the hot slices into the marinade and set it aside on a plate. Continue grilling and dipping the eggplant until all the slices are cooked and seasoned. Spoon the rest of the marinade over the cooked eggplant and then cover the dish with plastic wrap and set aside to marinate at room temperature for about 2 hours (or refrigerate for longer). Serve at room temperature.